A Christian film distributor wants to recruit more than 100 pastors to hold prayers at multi-screen cinemas in the UK. Kingdom Cinema is run by the Rev George Hargreaves, a former music producer and leader of the Christian Party. He began distributing Christian films last year, with one, God's Not Dead, reaching the top 20 in April. Now he wants pastors to speak and pray after screenings in December of Ragamuffin, about a Christian musician. He has negotiated with chains like Cineworld and Odeon for the pastors to address audiences after the movie which tells the story of Rich Mullins, who struggled with addiction and depression. Rev Hargreaves said: "It is not bashing people over the head with a Bible or making people embarrassed. "It will be a few minutes at the end of the screening just to wrap up the themes and let the audience know more about our faith. "It is a loving and respectful interaction with the audience." 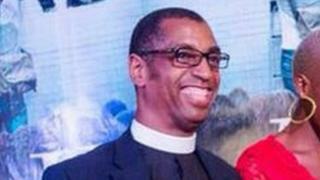 Rev Hargreaves, 57, was a pastor in Hackney, London, before moving to Wishaw, Scotland, three years ago. He contacted US film companies to let him release Christian movies in the UK and eventually they agreed to his plans. The first film to be released was The Black Nativity starring Forrest Whittaker. Then, in April, he persuaded 21 cinemas to show God's Not Dead which, that month, made it into the top 20 grossing films of the year, according to Box Office Mojo. Vue Entertainment said Ragamuffin was being reviewed by its film buying team. A spokeswoman said: "At this stage no decision has yet been made as to whether it will be screened at Vue cinemas." The BBC contacted Showcase, Cineworld, and Odeon cinemas, but they were unable to provide a comment.